Will a Tornado Be Covered on Car Insurance? Tornadoes can be especially damaging and deadly because of lack of warning. Luckily, damage to your car caused by a tornado can be covered by your car insurance depending on the coverage you have selected on your insurance policy. Knowing what your car insurance policy covers before disaster strikes will give you peace of mind for possible future damage. 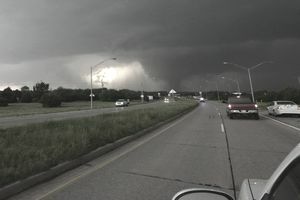 What Covers Tornadoes and High Wind Car Damage? Any kind of wind damage, whether from a straight-lined wind or tornado, is covered by your car insurance policy under comprehensive coverage. Possible damage includes your vehicle rolling over or debris flying into your vehicle due to high wind. Even if the wind catches your open car door and breaks the hinge, comprehensive coverage is what will help get your vehicle repaired. If you have selected a deductible on your comprehensive coverage, you will have to pay it in order to get your vehicle repaired. Deductibles reduce the cost of your insurance policy but require payment when you have a claim. Insurance companies waiving deductibles when damage is an “Act of God” is not true. It all has to do with how you originally set the coverage on your vehicle. How Do You Find Out if You Have Comprehensive Coverage? Sometimes especially after a devastating disaster like a tornado, you just cannot remember what coverage you purchased. Check these four spots to determine what coverage you have on your damaged vehicle. Declaration Page: Find your declaration page if you can. One is mailed or emailed to you at every renewal. Some policies renew every year while others renew every six months. Look for your damage vehicle to be listed with comprehensive or other than collision to verify if you are covered. You will also be able to see what your deductible is for the coverage. View Your Policy Online: Most insurance companies have your policy accessible online. You will more than likely need your policy number. Find your policy number on your proof of insurance, which should be in your car at all times. Call Your Insurance Agent: Your agent is a quick and knowledgeable resource. Call and ask if you are covered for the loss before filing the claim. After a major tornado disaster, all insurance agencies and carriers in the area are busy. However, looking up your coverage will only take a manner of minutes, so long as your agency has electricity, plus if you are covered your agent will be able to help you file the claim. Call Your Insurance Carrier’s Customer Service Number: Whether you talk to a customer service representative or a claims representative either should be able to let you know what coverage is listed on your policy. Ask to be transferred to claim representative if you have the appropriate coverage to file the claim.